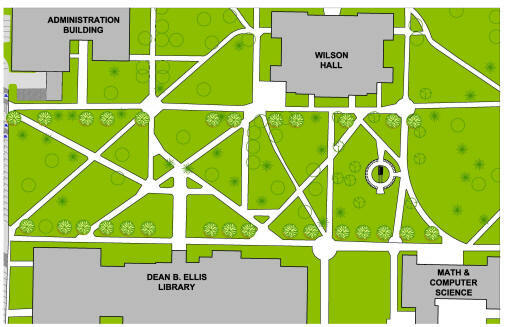 April 15, 2009 -- On Wednesday, April 22, Arkansas State University-Jonesboro will commemorate Earth Day with a celebration on the historic quadrangle, near ASU’s historic Centennial Arch and the Dean B. Ellis Library. The celebration will begin at 1 p.m. when Dr. G. Daniel Howard, vice chancellor, Academic Affairs and Research, introduces Jonesboro mayor Harold Perrin. Refreshments will be provided, and the event is free and open to the public. Perrin will discuss efforts Jonesboro has made to conserve energy and joint efforts between ASU and the city of Jonesboro to go green. Mayor Perrin will then introduce Carter Justice, senior project manager in construction for Nordex, the wind turbine manufacturing company founded in Denmark. Nordex recently selected Jonesboro as the site for its U.S. wind turbine assembly plant. Justice will speak to the crowd about wind energy, the construction of the new wind turbine assembly plant, and the Nordex company. Students from the Health, Wellness and Environmental Sciences Magnet School will also be present to display their environmentally friendly artwork from their reuse-recycle art fair. Bob Smith, of ASU Facilities Management, will receive a “Green Award” for Facilities Management's work in expanding the recycling facilities on campus. Focus the Nation 2009, a nationwide town hall forum on America’s energy future, has included ASU’s Earth Day celebration among its 103 town hall events held nationwide this month. These town hall events are designed to accelerate America’s transition to a clean energy future, and include participation by members of Congress and municipal mayors. The events are also part of a growing clean energy movement that urges young people, business leaders, elected officials and others to aid in the rapid creation of climate and energy solutions. Focus the Nation 2009 is online at http://focusthenation.org/. The celebration will conclude with the planting of 30 red maple trees on the historic quadrangle, bounded by the Dean B. Ellis Library on the south, Wilson Hall and the Administration Building on the north, Centennial Arch on the east, and Cooley Drive on the west. The trees will line the north and south sides of the quadrangle. The trees were donated or sponsored by college deans, departments, and student organizations, and each will be planted by a representative of the donating or sponsoring group. Download a pdf of this architectural rendering here. For more information, contact Dr. Jennifer Bouldin, at (870) 972-2570, or e-mail her at jbouldin@astate.edu. Architectural rendering courtesy of William Hall.